There is a litany of perspectives out there on the poor showing of the NDP and Thomas Mulcair in the recent federal election. They range from not being ‘left’ enough and corporate conspiracies to specific moments such as the niqab controversy and debate performances. The Orange Crush came up empty on Election Night. Why? Read on. The problem is that although some have some of these theories have merit, the issues identified were symptoms and not the illness. We suspect our perspective will be seen as simplistic – but it might be just that simple. The Liberals had a better product. The Liberal machine put together a campaign that was just shy of perfect in political terms, and New Democrats know it. They had some particular advantages such as a leader with incredible notoriety, an enviable vote efficiency, manageable expectations, and a campaign just long enough to bring it all together. On election day, voters that had identified as NDP supporters five weeks earlier voted Liberal. That is why Mulcair has 44 seats instead of ’just 35 more than the NDP had in 2011’. With all due respect to Mulcair, the niqab didn’t matter in terms of electoral fortune – it was just a bump in the road. The results speak for themselves: the Conservative’s numbers barely moved from 2011, the Bloc dropped five points, and the Liberals went up over 20 points. If the niqab mattered, it was only for a moment, and it wasn’t a vote-determining issue. In Quebec, the NDP finished a full 10 points behind the Liberals, who arguably had the same position. More than 60% of Quebeckers voted for the two parties (Liberal & NDP) who had a position that apparently 93% of Quebeckers disagreed with. The Bloc started the campaign at 17% according to Nanos and ended at 19.3%, popping up over 20% briefly a full three weeks after the niqab story broke. More Quebeckers voted for the Liberals and NDP in 2015 than in 2011. They just seemed to be attracted to the Liberals more – niqab be damned. What has become the traditional attack by Liberals and Conservatives (or the litany of provincial coalitions of the two) is that the NDP doesn’t understand business, will increase taxes, and generally can’t handle money. We have now seen three elections in a row where the NDP spent an entire campaign trying to prove they were up to the challenge: the 2015 Federal, the 2014 provincial in Ontario, and the 2013 provincial in British Columbia. The NDP is in the unenviable situation where they are in constant danger of being cut by both edges of the fiscal sword. If they don’t campaign on fiscal responsibility they fail to counter the primary attack on them, and if they do campaign on fiscal responsibility they are said to be saying whatever it takes to get elected – not to mention causing heartburn for their long standing base in labour and other social movements. We’ve spoken to a lot of folks from within the party who agree that it is a frustrating position to be in and don’t have a particular answer on how to deal with it. Most (including your author) say that they would have run the same economic campaign – with only minor changes. Our new theory? Ignore it. In Layton’s speeches and debate performances he rarely rattled off economic data, and when he did bring it up it was always in the context of direct family finances such as bank fees. In contrast, you can’t find a speech from Mulcair (or Horwath, and Dix) that doesn’t talk about big economics. This will irk some folks, but Trudeau talked about emotional issues at around 30,000 feet while Mulcair spoke about financial planning at about 100 feet. There is an interesting parallel to Layton v. Ignatieff. Jack Layton was an amazing leader and that helped greatly, but the product itself was superior to that of the Liberals in 2011. In 2011, the NDP had a campaign with the same feel as Trudeau’s: it was high level with a larger message, one that appealed to voters without getting stuck in the trenches. We had a budget and lots of numbers, but it never got in the way of the larger discussion of values. We were much better at ignoring our largest negative, fiscal management. If you want to test this yourself just go ask your ‘average voter’ friend to give you three adjectives on the Liberal and New Democrat campaigns in 2011 and 2015. You will find ‘average voter’ will use some of the same words to describe the Layton and Trudeau campaigns and conversely the same words to describe the Mulcair and Ignatieff campaigns. Don’t mistake our mention of ‘product’ as meaning just Layton or Trudeau (or any other leader) alone. Having a leader that is naturally charismatic is incredibly helpful, but the package around them has to be just as dynamic, including a message that is more than a collection of policies – it has to all connect to a larger emotion. In 2015 we weren’t able to do that, while the Liberals were. They presented voters with a near-perfect package: a charismatic leader, messaging that connected emotionally with a lot of Canadians, and (some) policies that supported that messaging. And so they won. Richard Tones is Director of Government Relations at Wazuku. Previously, he had a successful career in the labour movement. He’s a veteran NDP campaigner, a former aide to BC cabinet ministers, and one-time candidate. He’s from one of the great hometowns: Maple Ridge, BC. His full-length bio photo was too edgy for this blog. Brenton Walters’ firm Civil Communications offers campaign and communication services. He is a veteran campaigner including Tom Mulcair’s leadership and Vision Vancouver. He was raised in a small logging town on an island and then a small farming/hippy community outside a bigger town on a bigger island on the coast of BC. Diehard Whitecaps fan. Thanks to both Richard and Brenton for contributing. Looking to add more perspectives at Rosedeer.com in the months ahead. The Conservatives will be electing a new leader prior to the next federal election and, who knows, maybe the NDP too. When it comes to electing Leaders, BC might as well stand for “Barely Chosen”. I recently wrote on BC’s place in Cabinet since Confederation. Now, I’ve turned my attention to our place at the head of the table. In Canada’s history, I count 58 people who have led one of the contending national parties – Liberal, Conservative (including PC, Reform, Alliance), and CCF/NDP. Only 23 became prime minister. Of those 58, I count only three British Columbians among them. Rt. Hon. Kim Campbell remains the only BC-born and raised leader to win a national leadership among the three major parties since parties (not caucuses) began electing leaders. For the purpose of my analysis below, I’m designating John Turner as a British Columbian too. Well, he has to belong somewhere, and given that he spent his early years in Rossland, was a star student and athlete at UBC, and sought election in Vancouver-Quadra twice as a Leader, I claim him as a British Columbian. Aside from Campbell and Turner, BC’s performance in national leadership races has been very spotty. Hold on, we do get in the back door sometimes. Hon. John Reynolds served as Leader of the Opposition for the Canadian Alliance when Stockwell Day stepped down. By my math then, three British Columbians have served as Leaders (elected or otherwise) in the past 148 years. Then there are some on the bubble. Stockwell Day? He has as much claim to being a British Columbian perhaps as John Turner. He spent some his early years in BC and represented BC ridings as leader, yet for the purpose of this analysis, I’m classifying him as Albertan given that he was fresh from serving in the Alberta Cabinet. He might quarrel with that. Deborah Grey also spent early years in BC, is related to former BC Premier Boss Johnson, and lives in BC now. She served as Leader of the Opposition, in between Preston Manning and Stockwell Day. But she was clearly representing Alberta at that time. Liberals in BC might claim Justin Trudeau with his BC grandparents and work experience in the province, but you would have to put him in the Quebec column. Then there’s John A. who represented Victoria for four years as prime minister, but, look, since he hadn’t built the railroad yet, he didn’t even see his riding so, no, he doesn’t count. I’m tempted to add the federal Social Credit into this analysis to pump up BC’s numbers. They had an interim leader from BC in the 1960’s. Maybe the Greens should be considered too, but let’s stick to the major parties. I don’t have all day here, and neither do you. Therefore, that’s three leaders from BC, none elected in a general election as Leader. That compares to 17 leaders from Ontario, 13 leaders from Quebec, 7 from Alberta and Nova Scotia. The Yukon is breathing down our neck with 2 leaders. When the time a BC Prime Minister has been in office compared to other provinces, it’s a bit humbling. BC is at < 1 year combined (Turner and Campbell) while Quebec is 60+ years and counting. Our neighbour, Alberta, has had three elected prime ministers elected totalling about 15 years. Some might argue this type of analysis is pointless since national leaders embody more than their home-province. In some cases, they are very much pan-Canadian and hard to peg regionally. However, history does illustrate the challenge facing BC-based leaders. The focus of this piece is regional, but it’s important to note that only 5 of 58 leaders have been women. Three were NDP – Audrey McLaughlin, Alexa McDonough, and Nycole Turmel. Two Conservatives: Kim Campbell and Rona Ambrose. The Liberals have yet to elevate a woman as leader. The following table shows the leaders (elected and interim) by province by parties. Daniel MacKenzie from Cape Breton took over the helm of the Liberal Party upon Sir Wilfred Laurier’s death and contested the leadership against MacKenzie King, which he lost. Hazen Argue acted as interim leader before losing a subsequent leadership convention to Tommy Douglas (Argue left for the Liberals shortly thereafter). There’s Richard Burpee Hanson, a former Mayor of Fredericton and Trade Minister in the RB Bennett government, who served as interim leader after the Conservatives were trounced in the 1940 election. Not exactly a household name. He gave way to the comeback-kid Arthur Meighen when he returned to national politics after serving as PM twice in the 1920s. But Hanson had to stick around longer when Meighen lost a by-election, ending his brief return. New Brunswick’s other leader, Elsie Wayne, also served as an interim when Jean Charest left the post of PC leader to lead the Quebec Liberal Party. My brother was Leader ??? Erik Nielsen (“velcro lips”) was the first leader of a major political party from the North and was also a major force in the early years of Brian Mulroney’s government. 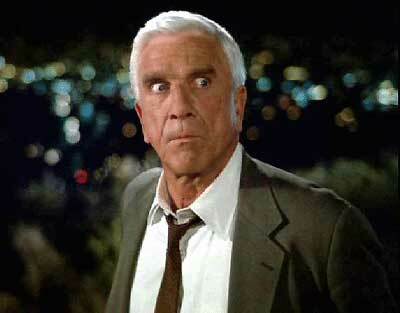 He was the brother of famous actor Leslie Nielsen (if you’re a Millennial, go see Airplane). Rona Ambrose joins this illustrious list. She may not be there for a long time but she has her job to do, as did recently Bob Rae, Nycole Turmel, and John Lynch-Staunton (whoever he is). Leaving aside historical footnotes, when you look at leadership conventions, not only is BC’s winning percentage quite miserable, the lack of participation by BC candidates also stands out, at least in Liberal and Conservative races. With the NDP, British Columbians keep running … and keep losing. The BC story is not very compelling when it comes to the Liberal Party of Canada leadership races. Again, I’m counting John Turner and he accounts for 67% of all BC candidates in the past 148 years. Joyce Murray is the other in 2013. That’s three candidates over 10 leadership races totalling 47 contestants. Well, it could be worse. Alberta Liberals haven’t found a way to show up at all. Neither has New Brunswick, PEI or Newfoundland, despite viable leadership candidates over the years like Frank McKenna, Brian Tobin, and Joe or Rob Ghiz. For a long time, the Liberals just didn’t have many conventions because their leaders were successful. MacKenzie King served for 29 years ! He fended off two Nova Scotians in 1919 and never looked back. Laurier lasted even longer – 32 years! Aside from the interregnum after Laurier’s death, Laurier and MacKenzie King spanned over 60 years between them. Incredible. When WLMK finally retired in 1948, former Saskatchewan Premier Jimmy Gardiner sought the leadership losing to Louis St. Laurent. Gardiner remains the strongest western candidate (other than Turner) to seek the leadership of the Liberals. The elected Liberal leadership has been a story of alternation between English Canada (principally Ontario) and Quebec. 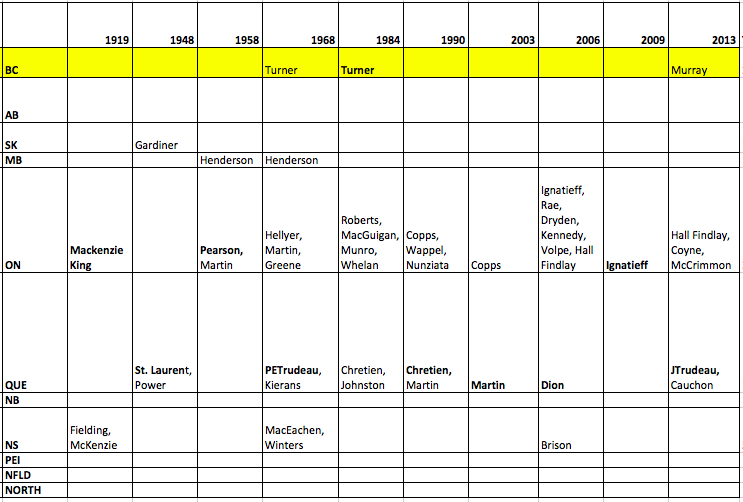 St. Laurent to Pearson to Trudeau to Turner to Chretien to Martin to Dion to Ignatieff to Trudeau. Very few Maritimers or Westerners. It’s the Upper-Lower Canada show. In recent times, this reflects the woeful state of the Liberal Party in Western Canada from the mid 1970s to, basically, October 19th. While there have been regional heavyweights like Lloyd Axworthy, their ambitions were thwarted, in part, by a lack of regional caucus colleagues and party infrastructure. For many years, senators not MPs called the shot in western provinces for the Liberals. That is not a good starting point for a leadership race. John Turner, for all of his BC roots, drew heavily from his Bay Street and Montreal power bases. Hedy Fry waved the flag in 2006, deciding to withdraw before the convention, choosing to endorse Bob Rae. 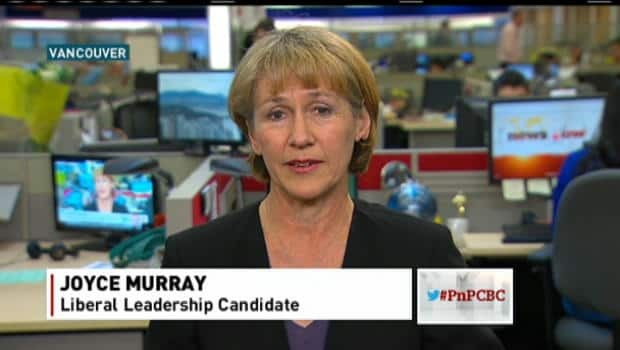 Joyce Murray finished second among six contenders in 2013, though Justin Trudeau walked away with over 80% support on the first ballot. In both Fry and Murray’s case, they were putting a stake in the ground for British Columbia which no one, but for Turner, had ever done in the party’s history. This analysis encompasses the Conservatives, the Progressive Conservatives, the Reform Party, and the Canadian Alliance. These are all parties that have governed or acted as the Official Opposition. Of the 16 leadership conventions among Canada’s conservative parties since 1927, there have been eight BC-based candidates – a much stronger showing by British Columbians than in Liberal races. They make up 9 candidacies out of a pool of 75 contestants. In 1942, two British Columbians challenged for the leadership, losing to incoming leader John Bracken from Manitoba. HH Stevens had been a major force in RB Bennett’s government prior to a bitter break whereupon he led his own party – the isolationist Reconstruction Party – in the 1935 election, surpassing the fledgling CCF and gaining 8.7% nationally. He split the vote in the process and decimated the Conservatives. He won only one seat – his own. Howard Green had a long career in Parliament ultimately serving as Minister of External Affairs under Rt. Hon. John Diefenbaker. Both Stevens and Green were from Vancouver. E. Davie Fulton from Kamloops challenged for the leadership twice, in 1956 against Diefenbaker and again in 1967, when he sought to succeed Dief. He lost to Nova Scotian Robert Stanfield. Fulton would serve as Justice Minister but returned to BC in an ill-fated stint as provincial Conservative leader where he was trounced by WAC Bennett. In both conventions, he finished third and was probably BC’s best hope as prime minister material for decades. Fulton’s leadership runs deserve attention. He was a national figure who, as Justice Minister, had attracted the best and the brightest. A Catholic, and bilingual, he worked hard to develop support in Quebec. As Minister, he unsuccessfully proposed the Fulton-Favreau formula to bring about the patriation of the Constitution. In 1967, he had the support of future prime ministers Joe Clark and Brian Mulroney. He was seen as a modern man when he lost to Diefenbaker, and perhaps missed his window when he lost in 1967, though still only in his early 50s. An interesting footnote from the 1967 PC convention was the candidacy of Mary Walker Sawka. Not much is written about her candidacy but it appears she was a filmmaker from Vancouver. Her candidacy was last-minute and she garnered two votes. The Globe & Mail cruelly reported that Walker Sawka “looked like a housewife who had mistakenly wandered on stage while looking for a bingo game”. She is the first BC woman to seek the leadership of a major political party. Moving on to the 1976 PC leadership convention, Vancouver South MP John Fraser was one of 11 candidates seeking to replace Robert Stanfield. Stanfield had three runs at prime minister, losing to Rt. Hon. Pierre Trudeau each time, once by a hair. Fraser, at the time, was in his early 40s. He lasted two ballots, finishing eighth, and bringing his support to Joe Clark. Clark started that convention third with 12% of the votes on the first ballot and prevailed when he garnered down ballot support, leaping past Quebec frontrunners Claude Wagner and Brian Mulroney. Fraser went on to serve as the senior BC minister in both the Clark and Mulroney governments, prior to becoming Speaker of the House of Commons. British Columbians sat out the 1983 leadership tilt. Many BC Red Tories stuck with Joe, while a lot of ‘young turks’ from BC supported Mulroney. The BC branch was very united behind Kim Campbell in 1993. Campbell had resigned her provincial seat mid-term in 1988 to run federally. She had had enough of the Vander Zalm government and sought to replace Hon. Pat Carney. She won Vancouver Centre (back when PCs could win in the urban core) and was appointed Minister of Justice. She built a considerable profile and went on to serve as Minister of National Defence. The Mulroney government was deeply unpopular in its second term. Following its 1988 re-election on the strength of Free Trade, it brought in the controversial GST (which no government will remove now) and paid a heavy political price. Layered on was the ongoing constitutional quagmire following the failure of Meech Lake in 1990. The 1992 national referendum to approve the Charlottetown Accord failed badly and sealed Mulroney’s fate. Unfortunately for successors, he did not leave a lot of time for a leadership convention in advance of a general election. Five years were almost up. While there was some early hopes for Campbell following her convention win over Jean Charest, her support wilted over the summer and fall. She was annihilated by the Chretien Liberals, and with that, her leadership of the party ended. For once, a BC born (Port Alberni) and raised politician had climbed to the top in a party’s leadership process. While the outcome was clearly a disappointment for her, Rt. Hon. 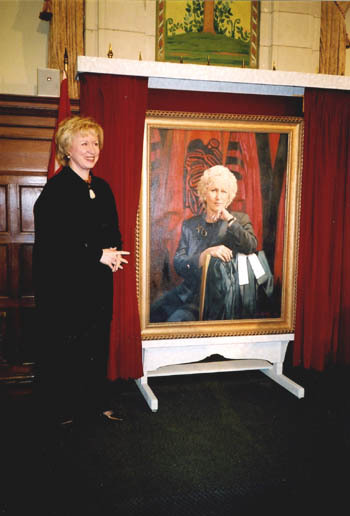 Kim Campbell remains the exception in 148 years of Canadian politics not only as a BC prime minister, but also as the only female prime minister. Two more British Columbians round out the slate of those seeking the leadership of conservative parties. Keith Martin from the Victoria-area sought the leadership of the Canadian Alliance in 2000, finishing back in the pack. The other contender is a bit of a stretch. Stan Roberts sought the leadership of the Reform Party against Preston Manning in 1987. He didn’t make it to the ballot but he was instrumental in the formation of the Reform Party. I’m including him because he was an interesting character. A Liberal MLA in Manitoba. A head of the Canadian Chamber of Commerce. A VP of Simon Fraser University. A candidate for the BC Liberal leadership in 1984, losing to Art Lee. A federal Liberal candidate in Quebec in 1984 (unsuccessful). And finally a contestant for the Reform leadership. I will count him as a BCer for the purposes of this list. We need all the help we can get. Of the 16 total conventions across the conservative movement, Albertans have won 44% of them. Rt. Hon. 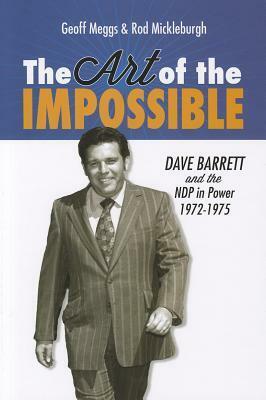 RB Bennett was first then a long wait until 1976 when Joe Clark won the PC leadership (and he would win it again in 1998). Stockwell Day, Preston Manning, Stockwell Day, and Stephen Harper round out the list. Alberta has had a strong run in modern times and possibly more to come. Having Albertan Rona Ambrose as Interim Leader seems to be rubbing it in! Unlike the Liberals, conservatives prefer to go outside Ontario and Quebec, only choose four of 16 from Upper/Lower Canada and not an Ontarian since 1948. British Columbians have been a part of seven of eleven CCF/NDP conventions since 1932. The first two leaders – JS Wordsworth and MJ Coldwell – were elected unanimously. (Technical point: I’m counting leadership challenges to incumbent leaders in 1973 and 2001). Frank Howard reels in 50 lb ling cod near Klemtu. He reeled in a lot of votes over the years too. BC’s presence at CCF/NDP conventions starts with Frank Howard, a strong Trade Unionist who hailed from northwest BC and served as an MP for 17 years and, later, MLA from Skeena. Howard’s story is a fascinating one and is recorded eloquently by Tom Hawthorn in Howard’s obituary. He was a fighter who rose from “Cell Block to Centre Block” – an ex-con from the humblest of roots who fought hard for his constituents. He would lose the leadership race in 1971 to David Lewis. The 1975 NDP convention that elected Ed Broadbent was the scene of the strongest bid by a British Columbian to lead a major party, at that time. Rosemary Brown, then an NDP MLA from Vancouver, finished second with 41% on the final ballot. The first Black politician to seek the leadership of a major party, Brown received many accolades after she retired from elected politics in 1986, including an Order of Canada and Order of BC. She was also featured on a Canada Post stamp. Ed Broadbent had a long run as leader, but when he left, British Columbians jumped in. The 1989 convention saw three west coasters jump in: former BC Premier Dave Barrett, MP Ian Waddell, and grassroots member Roger Lagasse. Barrett is the only BC premier to ever seek the leadership of a federal party. Barrett was a strong contender, but lost to Yukoner Audrey McLaughlin. McLaughlin had been elected in a by-election to replace “velcro lips” and had a different style than Barrett, setting up a classic showdown. Of 2400 votes cast, only 80 separated the two on the first ballot and even fewer after the second ballot (Waddell and Lagasse dropped after the first ballot). This convention had some candidates, including MP Simon de Jong, wearing an invisible mic. To the consternation of many participants, CBC TV revealed the inner workings including backroom negotiations between de Jong and Barrett. de Jong was heard to say, “Mommy, what should I do?” He went to McLaughlin, who defeated Barrett 55% to 45% on the final ballot. Another close call for a BC candidate. McLaughlin tanked in the 1993 convention, hampered by unpopular NDP governments in BC and Ontario. Of the two remaining NDP MPs in BC, one was the brilliant yet polarizing Svend Robinson. Svend – any observer in BC would know who you were talking about – was at the forefront of major issues concerning the environment, aboriginal rights, and right-to-die. He also had a reputation as an excellent constituency MP. In 1995, he was 43 years old but had already served 16 years in Parliament. Herschel Hardin from Vancouver was also a candidate in the process. The 1995 convention had an incredible outcome. For the first time in NDP history, a British Columbian led after the first ballot. Svend had 38% to Alexa McDonough’s 33% and Lorne Nystrom’s 32% (Hardin was part of the process but didn’t make it to the first ballot). Svend sized up the result and decided that there was no way he could win. In an unprecedented move, he withdrew from the race – despite leading – handing the leadership to McDonough. And so went another BC leadership candidate. The 2003 NDP convention that elected Jack Layton did not see a significant BC presence, with only grassroots member Bev Meslo offering her name. In 2012, MP Nathan Cullen emerged as a contender through the course of the campaign, taking on favourites Tom Mulcair and past-party president Brian Topp. Cullen rose from 16% to 20% to 25% on consecutive ballots but that’s where it ended. He couldn’t make it past Brian Topp to get to the showcase showdown. As NDPers ponder their fate and their future, they may well grant Tom Mulcair another chance. He delivered more seats than any other leader except Layton, but clearly fell far short of expectations. If he does move on, BC may well be in the heart of another national leadership race with Nathan Cullen surely a leading contender. MPs from BC make up almost a third of the NDP caucus which puts a BC candidate in a good position. The Conservatives also face a choice. Once again, Alberta is in a strong position having elected 29 of their 99 MPs, while BC’s Conservative caucus slipped to 10. Albertans Jason Kenney and Michelle Rempel are two candidates that spring to mind as contenders, along with Ontario’s Kellie Leitch and Tony Clement, Quebec’s Maxime Bernier, and Nova Scotia’s Peter Mackay. Saskatchewan Premier Brad Wall ruled himself out. But what about a BC candidate? My view is that it would be good for Conservatives in BC to have an oar in the water in this race, if for nothing else but to show up. If this lengthy analysis shows anything, British Columbians are less likely to show up to a Liberal or Conservative race, and when they do, the results speak for themselves. While the Conservatives have been more active than Liberals, as the third largest province, there should be someone in that race. And the next NDP race. And when Justin retires in 2035 (because it’s 2035), there should be a British Columbian in that race too. Ed Fast – you led the TPP negotiations. What say you? Dianne Watts – you led the fastest growing city in Canada – a strong urban, female voice – what your party needs. Cathy McLeod – a former small town mayor who was re-elected in a tough seat. Alice Wong – putting a Chinese candidate on the national ballot, and, frankly, a constituency where the Conservatives have a strategic advantage. James Moore – c’mon, you wanna work at a law firm and miss this? Now firmly ensconced as a British Columbian, Stockwell Day would be a major contender if he stepped up, but Stock would likely say that the Party needs renewal. A business case can be made for many BC Conservatives to show up on the ballot, for BC’s sake, not to mention their own electoral hopes here. In conclusion, BC is a tough place to represent in Ottawa. The travel imposes a heavy toll on individuals let alone their families. Serious kudos are deserved for anyone who strives to lead from British Columbia. My hat goes off to those who have tried whether they were serious bids or quixotic ones. Combing through history to write this piece, I am struck by the quality of candidates from BC who didn’t make it. The ambivalence of British Columbians to federal politics may in fact be the greatest handicap to success. When 148 years are counted up, among born and raised British Columbians, only Kim Campbell can truly say that she made it to the mountaintop, as brief as it was. Hopefully we’ll see more try. BC is off to a decent start in terms of Cabinet clout with three new federal cabinet ministers today: Hon. Jody Wilson-Raybould (Justice and Attorney-General of Canada), Hon. Harjit Sajjan (National Defence), and Hon. Carla Qualtrough (Sport and Persons with Disabilities). All rookie MPs, which is without precedent in modern times. Rt. Hon. Justin Trudeau is the 3rd prime minister to be an alumnus of the University of British Columbia, joining Rt. Hon. John Turner and Rt. Hon. Kim Campbell. BC’s place at the Cabinet Table. An historical review of BC’s representation in Ottawa since it joined Confederation in 1871. Cabinet Committee assignments for BC ministers. What will BC’s ministers be up to? Hon. Jody Wilson-Raybould, Hon. Harjit Sajjan, and Hon. Carla Qualtrough sit on a variety of important committees with Wilson-Raybould and Sajjan on Agenda & Results. 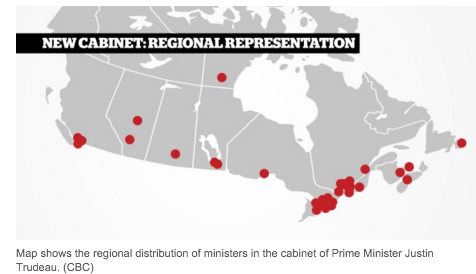 The Justin Trudeau Cabinet by Region. How does BC fare versus other regions? With 12% of the seats in the House of Commons and 9% of the seats in the Liberal Caucus, BC’s Liberal delegation composes 10% of the Cabinet’s membership. Jody Wilson-Raybould a First Nations first. Wilson-Raybould is first female First Nations person elected in British Columbia history. Now, she’s the second FN cabinet minister from BC, following in footsteps of Hon. Len Marchand. BC’s federal cabinet ministers Jody Wilson-Raybould, Harjit Singh Sajjan and Carla Qualtrough will be busy. Cabinet committee mandates and memberships indicate they will be spending a lot of time in meeting rooms. They will now begin the four year tug-of-war between cabinet duties and constituency visits. The pre-eminent Cabinet sub-committee chaired by PM Trudeau. Both Wilson-Raybould and Sajjan are members of the 11 member committee. Chair Hon. Scott Brison. No BC ministers. Chair Hon. Dominic Leblanc. No BC ministers. Chaired by Health Minister Hon. Jane Philpott. This committee is mandated to “grow the middle class”. No BC ministers. Chaired by Immigration Minister Hon. John McCallum. This committee is mandated to improve relationship with indigenous Canadians and promote diversity, multiculturalism, and linguistic duality. Wilson-Raybould and Qualtrough are members. Responsible for promotion of Canadian values and interests abroad, and domestic/global security. Chaired by Hon. Ralph Goodale (Public Security ministers), Wilson-Raybould is vice-chair and Saijjan is a member. Mandated to “foster strong relations”. Chaired by International Trade Minister Chrystia Freeland, Wilson-Raybould andSajjan are members. Chaired by PM Trudeau, Wilson-Raybould is vice-chair,Sajjan is a member. Chaired by Hon. Judy Foote, Qualtrough is vice-chair, Wilson-Raybould is a member. Chaired by Foreign Minister Hon. Stephane Dion. No BC ministers. 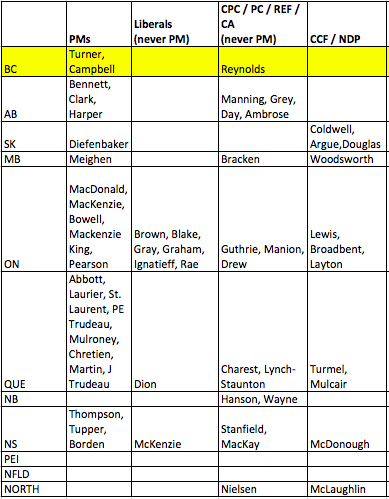 By my count, Wilson-Raybould sits on six cabinet committees (vice-chair of two),Sajjan sits on four committees, and Qualtrough two (vice-chair of one). Treasury Board, Growing the middle class, and Climate Change are three committees where a BC presence is missing, but realistically, BC’s ministers can’t be everywhere. With two on Agenda & Results, BC has a fair crack to be heard. Prime Minister Justin Trudeau announced his new cabinet today. Here’s a spatial look at the geographic base of his ministers. The following table breaks down the number of ministers by province and how that compares to the size of the LPC caucus in each province/territories (P/T), and how cabinet representation relates to the proportion of that P/T’s share of the LPC national caucus and share of seats overall. BC’s share of the House of Commons (HOC) is 12%. Quebec’s proportion of HOC, proportion of Lib MPs as share of national Caucus and Cabinet are very consistent at 22-23%. Atlantic Canada makes up 17% of the Liberal Caucus compared to 9% of overall seats, and 13% of cabinet. The Prairies make up 18% of the HOC, but only 7% of the Liberal Caucus. Their share of cabinet seats is 16%. Which regions have the most MPs utilized in Cabinet? Overall, PM Trudeau has carefully balanced regional delegations as a proportion of his Cabinet. He has chosen to ensure cabinet is balanced by region, not by proportion of Liberal MPs by region. If he had done so, there would be more cabinet ministers from Atlantic Canada (where he swept) and fewer from the Prairies where he took 12 of 62. With Wednesday’s cabinet announcement looming, what will it mean for British Columbia? BC’s place at the Cabinet table was at the head of the table in the 1870s when Sir John A. MacDonald was elected from Victoria in 1878, despite never having seen the place. He would eventually visit Victoria once he fulfilled the ultimate the election promise – the construction of the CPR. Who have been BC’s heavyweights at the cabinet table? An historical review reveals British Columbia’s conflicted past in dealing with race relations and uneven influence compared to its provincial peers. In the late 1800’s, Edgar Dewdney was elected from Yale BC and served as an MP under Sir John A. MacDonald, becoming a partisan loyalist, personal friend, and ultimately an executor of his will. Lured to BC by the Gold Rush, Dewdney’s name is remembered through major roads (Dewdney Trunk) and localities, principally for his role in surveying the province. John A. dispatched him to oversee the territories as a direct report where he dealt with the Riel Rebellion and the demise of buffalo herds and resulting starvation. Not averse to mixing public duties with private land speculation, he eventually made it to federal cabinet in 1888 but not from BC; later, he was appointed BC Lieutenant-Governor. A BC cabinet minister? Not exactly, but an influential British Columbian at and near the cabinet table, yes. Conservative Martin Burrell, representing Yale-Cariboo, served in Prime Minister Robert Borden’s Conservative and Unionist cabinets as Agriculture minister, Mines Minister, and Minister of Customs & Inland Revenue. An interesting note about Burrell (a former mayor of Grand Forks), was that he was appointed Parliamentary Librarian in 1920 and served in this post until his death in 1938. Future BC premier Simon Fraser Tolmie would serve in both of Arthur Meighen’s cabinets as Minister of Agriculture. In both stints, Meighen’s governments were momentary, outfoxed by William Lyon MacKenzie King. Along with Ujjal Dosanjh, Tolmie has been one of two BC premiers to serve in a federal cabinet. Other premiers, such as Amor de Cosmos, Fighting Joe Martin, and Dave Barrett, also served in Parliament. Conservative heavyweight HH Stevens served in Meighen’s brief cabinet (1926) then for four years under Prime Minister RB Bennett. He was a powerful Trade minister who crusaded against price-fixing. He resigned in epic fashion and created the Reconstruction Party which split the vote and destroyed the Bennett government in 1935. He returned to the Conservatives thereafter but his political career fizzled out. HH Stevens probably remains the most notable figure in Canadian politics coming from BC between Confederation to the end of WWII. Perhaps it was the librarian Burrell who left the most lasting mark. The service of James Sinclair bears mention – the grandfather of incoming Prime Minister Justin Trudeau. He was a Member of Parliament from Vancouver-North and Coast-Capilano from 1940 to 1958, when he was defeated in the Diefenbaker sweep. 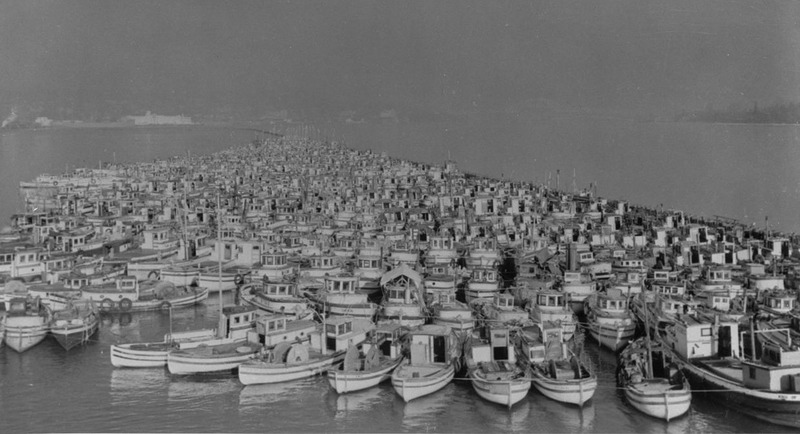 He served as Minister of Fisheries from 1952-57. The Sinclair Centre in Vancouver bears his name. The Diefenbaker era ushered in BC’s first dose of serious cabinet clout. From 1957-63, three senior ministers hailed from the west coast. E.Davie Fulton as Minister of Justice for much of that time; Howard Green, ultimately serving as Secretary of State for External Affairs; and George Pearkes, Victoria Cross recipient, served as Minister of National Defence prior to his appointment as BC’s Lieutenant-Governor in 1960. Fulton left federal politics to lead the BC Conservative Party, but was thwarted by the governing Socreds. The election of the Pearson government in 1963 continued BC’s cabinet presence with capable ministers, albeit at a less prestigious level than the Diefenbaker years. Arthur Laing served in Pearson’s cabinet as Minister of Northern Affairs and Natural Resources then later as Minister of Indian and Northern Affairs. A former leader of the BC Liberal Party, Laing was the “BC Minister”; the bridge from YVR to the City is named in his honour. Laing’s wingman in cabinet was John Nicholson who served in various posts under Pearson. While BC held at least three seats in cabinet during the first PET ministry (1968-79), BC seemed to lose ground with other provinces who had powerful ministers. While BC was not without credible ministers, the Marc Lalondes, Jean Marchands, Jean Chretiens, John Turners, and Allan MacEachens defined the Trudeau era at the cabinet level. In 1968, Prime Minister Pierre Trudeau brought young Vancouver MP Ron Basford into cabinet as Minister of Consumer and Corporate Affairs. He is remembered as the minister who championed Granville Island among other BC legacies. Laing continued in Public Works until 1972. Jack Davis served in Fisheries and Environment portfolios between 1968-1974 (before his election as a Social Credit MLA). Len Marchand and Iona Campagnolo both served as Ministers of State in the mid 1970s, with Marchand finishing as Minister of Environment in 1979. 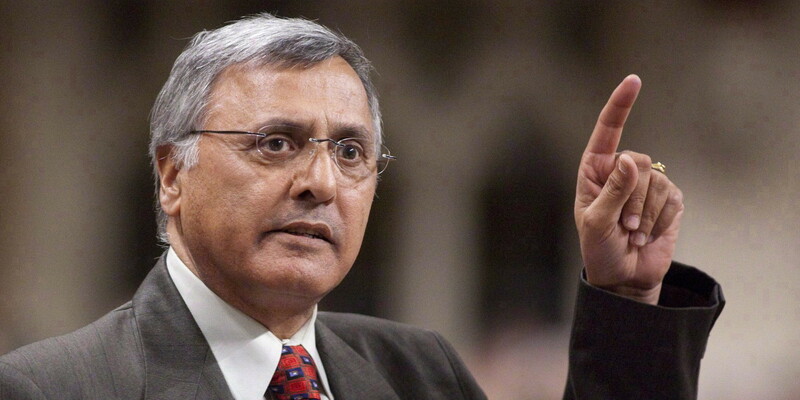 Marchand was the first First Nation cabinet minister and first FN Member of Parliament in Canadian history. Senator Ray Perrault served as Government House Leader from 1974 to 1979. The short-lived Joe Clark government featured prominent BC politicians like Minister of Environment John Fraser, Defence Minister Allan MacKinnon, and Minister of State Ron Huntington (father of Delta South MLA Vicky Huntington). Their tenures were short-lived when the Clark government was defeated in the House. Fraser ran for leader in 1976, dropping off on the second ballot but delivering his support for Clark. When PET was returned in 1980, he had the makings of a strong front bench from BC. Popular ex-mayor Art Phillips had been elected to the Liberals in 1979, serving in Opposition. Former BC Liberal leader Gordon Gibson contested North Vancouver-Burnaby while renowned resource economist Peter Pearse sought election in Vancouver Quadra. Three strong ministers except that none were elected, nor were any Liberals in BC. Wipe out. Senators Jack Austin and Ray Perrault became BC’s unelected representatives in Cabinet. Perrault was later dropped, contributing to BC’s alienation from the Liberal Party. When Prime Minister John Turner decided to seek office from Vancouver-Quadra in 1984, he sought to bridge the divide between the Liberal Party and the west coast. While he gained his seat (in the face of an electoral onslaught), he alone was elected from BC. Turner’s BC story is a compelling one. He spent his early early years in Rossland and, while his formative years were spent in Ottawa, he returned to UBC for university (his stepfather was Lieutenant-Governor) where he was very much Big Man on Campus along with being Canadian 100 metre sprint champion. His BC years are chronicled in Elusive Destiny, an apt title for a political giant who’s timing was off. (Incredibly, his Olympic dreams were dashed when his car was hit by a train on the Arbutus Corridor! Who woulda thunk it). Turner served as MP for Vancouver Quadra for 9 years, retaining his seat after relinquishing his leadership to Jean Chretien. He had a strong BC connection but Turner was very much a pan-Canadian, representing three provinces during his illustrious parliamentary career. From 1984 to 2004, BC had a steady presence at the cabinet table, not strikingly influential, but produced our first prime minister. “Tunagate” but his stature among MPs led him to a much-dignified election and reign as Speaker. Carney would move to International Trade during the dramatic US-Canada Free Trade negotiations. Tom Siddon would replace Fraser, and others like Gerry St. Germain, Frank Oberle, and Mary Collins would ultimately join Mulroney’s cabinet. St. Germain was a Mulroney favourite. The bilingual, Metis chicken farmer was my MP and opponent when I rode my ten-speed down to Mae Cabott’s Liberal campaign office on the Lougheed Highway in 1984. Gerry taught me a lesson in humility by spanking our campaign (Tip: be careful burmashaving on a busy highway when everyone hates your political party). Incredibly to me, having been appointed to cabinet, Gerry lost his seat in 1988 at the very moment he was poised to move up in the cabinet ranks. BCers often choose protest over pragmatism. In 1988, Carney did not run again creating a vacancy in Vancouver-Centre. Back then, Progressive Conservatives were electable in that riding, unimaginable, it seems, now. Kim Campbell resigned her seat in the provincial legislature part way through her first term and secured the PC nomination, won the seat, and catapulted herself into Cabinet. As Justice minister (then National Defence), she held a high national profile, and emerged as the consensus favourite to succeed Mulroney following the demise of the Charlottetown Accord. Campbell fended off Jean Charest for the leadership win. She had a strong BC network behind her, like Chief of Staff Ray Castelli and other apparatchiks that have been a big part of BC politics, but Mulroney did not leave her much time and the subsequent election played out for her like it did for John Turner, except worse. The party was decimated and, like 1984, Vancouver bore witness on election night to a humiliating concession speech by a sitting prime minister. Jean Chretien’s election in 1993 and subsequent cabinets through 2003 had consistent BC representation, yet not too flashy. David Anderson, elected in 1968, then BC MLA and Liberal leader, returned from the political wilderness in 1993 to serve as National Revenue Minister before moving on to Fisheries then his signature role in Environment. Herb Dhaliwal was another prominent minister during the Chretien era, following Anderson in National Revenue and Fisheries before going to Natural Resources. Ministers of State include Stephen Owen, Raymond Chan, and Hedy Fry. Chretien could never elect more than 6-7 from BC so he didn’t have a lot to choose from. Harper’s first cabinet contained a major surprise – David Emerson. To the astonishment of Liberals and Conservatives alike, the Liberal star switched jerseys, eschewing politics for policy, and assumed the International Trade portfolio and eventually Foreign Affairs before he left office in 2008. Emerson was joined from BC by former Canadian Alliance leader Stockwell Day (Public Safety, International Trade, Treasury Board), Chuck Strahl (Agriculture, Indian and Northern Affairs, Transport), and Gary Lunn (Natural Resources). Jay Hill’s appointment in 2007 as Whip (elevated to cabinet) then Government House Leader would make it five ministers for the BC delegation, matching Martin. BC had considerable clout. Emerson, Day, Strahl and Hill would all choose to leave politics by 2011, and Lunn involuntarily. They would give way to James Moore, who started in Heritage and went to Industry, Ed Fast – who may have the Trans Pacific Partnership as his legacy, John Duncan, Kerri-Lynne Findlay, and Alice Wong. As the Harper mandate struggled in its final years, so too did its profile in British Columbia – not an uncommon life cycle for aging governments. Only Ed Fast and Alice Wong remain in Parliament from the Harper cabinets. For many Liberal governments in the Pearson-Trudeau-Chretien eras, it was often a case of being “west of the best” or so it seemed. BC had many capable ministers during this time but very few national personalities that one hearkens back to when remembering an era. Ron Basford may have the strongest claim for cabinet legacies. The Martin government went in a stronger direction for BC but it’s lifespan was short. Harper’s team started off strong but seemed to fade down the stretch. Good people, good ministers, but lacking a sense of oomph. Conservative cabinets have seen BC eclipsed by Conservative-crazy Alberta, which has established the storyline for much of the past 40 years. Alberta had leader (1976-83) and Prime Minister Joe Clark (later Secretary of State for External Affairs and lead constitutional negotiator) and Deputy PM Don Mazankowski. The demise of the PCs was born in Alberta too with Preston Manning’s Reform Party. The evolution and return of the conservative movement was an Alberta story – Stockwell Day (who ran for leader of the Alliance from Alberta before moving to BC) and Stephen Harper led in succession. Harper’s cabinet also featured prominent Albertan personalities such as Jim Prentice, Rona Ambrose, and Jason Kenney, who may well be the next in a procession of Alberta Conservative leaders. British Columbians have risen to prominence in the NDP, although not usually to the top. Tommy Douglas led the party from a base in BC for a time. Rosemary Brown, Dave Barrett, Svend Robinson, and Nathan Cullen have all been serious national leadership contenders, though unsuccessful. There’s one major disadvantage: Distance. How many people want to fly 3000 miles back and forth each week? Time spent traveling is enough to dissaude anyone, especially those with younger children. A point of regional unfairness is that BC ridings have more population than most provinces due to Canada’s constitutional side deals. The vast expanse of Skeena has far more constituents than ridings in Saskatchewan, Manitoba or any in the Maritimes. How does that make sense? It makes a tough job even tougher. Political culture. Federal politics is more abstract to British Columbians. While we saw 70% turnout in the recent election, BCers do not live and die by federal politics. If they did, Keith Baldrey might report on federal politics more than twice a year. But they don’t. BC media outlets have only two reporters in Ottawa (Vancouver Sun and the Tyee). Provincial politics is the main sport and drives the media’s and the public’s interest. Protest over politics. We have often gone the other way when Canadians elect their governments. BC abandoned PET in 1980, cut down the PC team in 1988, and kept Chretien on a short leash. Then there’s the network. It’s tough to aspire to national leadership when the critical mass is elsewhere. Kim Campbell remains the only BC-raised prime minister. Alberta has figured out how to gain national office, but no one here. HH Stevens may have had the first good chance in the dying days of the RB Bennett government but he passed on it. E.Davie Fulton was a thorn in Diefenbaker’s paw, but finished third to Dief in the 1956 PC leadership, and third again trying to succeed him in 1967. John Fraser tried in 1976. Hedy Fry and Joyce Murray both made quixotic bids to lead their parties but were never in contention. Of course, fewer BC politicians speak french than in eastern provinces. This has been a drawback in climbing the greasy pole. James Moore does, but he is another BC politician who has ruled out a national bid. Prime ministers have been piled up like cordwood from Quebec, Ontario, and Alberta. Even Saskatchewan has had its run; BC has but one brief stint from one of its own prior to her electoral slaughter. Where have been the Finance Ministers from BC? Many excellent ministers from BC have served at the cabinet table, but my overall assessment is that we, as a province, haven’t been exceptional in the federal arena. In part, because many have chosen not to run. Unlike any Liberal prime minister since his father in 1968, Justin Trudeau has more than a handful of MPs to choose from in BC. However, BC will have to be patient. ‘Heavyweight’ cabinet ministers usually don’t start out that way. 13 of 17 Liberal MPs from BC arrive in Ottawa with no federal experience. It will take time for BC’s new ministers to learn the ropes and gain effectiveness in the race for competing resources. Trudeau is probably the first elected prime minister in Canadian history to claim extensive BC roots and a strong family connection, though Quebec rightly has first claim. I wish the new BC appointees patience and perseverance. BC’s clout in cabinet over the years has been checkered. Let’s hope they elevate BC’s priorities to their rightful place. BC netted two major cabinet portfolios with the appointment of the Hon. Jody Wilson-Raybould (Justice and Attorney-General) and Hon. Harjit Singh Sajjan (Defence). Hon. Carla Qualtrough (Sport and Persons with Disabilities) rounds out the BC cabinet delegation. Both Wilson-Raybould and Sajjan represent Vancouver seats while Qualtrough is one of five Liberal MPs elected south of the Fraser. When is the last time BC’s delegation has been entirely made up of rookie MPs? I’m not sure there is a precedent in the past 100 years. Hon. Jody Wilson-Raybould and Hon. 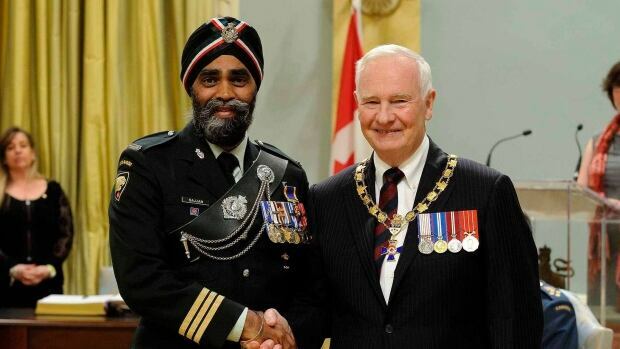 Harjit Singh Sajjan continue to serve in their major portfolios. Hon. Carla Qualtrough received a promotion to Public Works and was affirmed in that role in July 2018. Hon. Jonathan Wilkinson joined Cabinet on July 18 as Minister of Fisheries & Oceans, following in the footsteps of other BC ministers like David Anderson, Herb Dhaliwal, Tom Siddon, John Fraser, Jack Davis, Rt. Hon. Justin Trudeau’s grandfather, Jimmy Sinclair. Historical list of Fisheries & Oceans ministers here. ** This post was taken from a number of sources and not always easy to piece together BC’s federal voice. If there are any sins of omission or commission, please comment. Thank you.